1st segment: Scot said last Wednesday, he and Rick Heil traveled to the Hynes Convention Center in Boston to tape a special show at the first day of the National Catholic Educational Association annual convention, which gathered 10,000 people in Boston to discuss Catholic education. Scot said it was a joy to be surrounded by so many people who had such a great spirit of hope for the future of Catholic education in this country. Rick said a lot of the workshops he poked his head into had a great energy and he noticed a great emphasis on the Catholicity of their education. 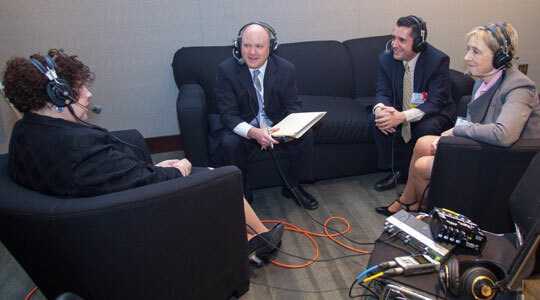 2nd segment: Scot welcomed listeners to the Hynes Convention Center and welcomed Mary Grassa O’Neill, Sheila Kukstiss, and Jorge Hernandez from the Catholic Schools Office of the Archdiocese of Boston, who were key to the organization of the NCEA convention in Boston. Mary said it’s brilliant that the NCEA is in Boston because it means all of our Catholic schools can participate and as Cardinal Seán said, we love showing off our city. It’s a once in a lifetime career opportunity for many to meet their colleagues from across the country. Sheila said there were two award recipients from Boston for honors from the NCEA. Sheila said the recipients were St. Patrick Parish in Lawrence and Cardinal Spellman High School in Brockton, honored for their Catholic identity. Sheils said it was a had choice to single them out among all the schools. She said what stood out at St. Patrick was the work with Cor Unum meal center. Cardinal Spellman does a great job with getting their students alive with Catholic identity through their liturgies and Catholic service teams. Scot asked Jorge about his initial experiences at NCEA. It was his first time at the convention. He said it’s great to have all these people in Boston over the course of three days, all invested in helping Catholic education thrive and grow. Jorge is Area Superintendent for the Merrimack Valley in the Schools Office. He said it wasn’t hard to convince educators in his area to attend the NCEA. Scot said Cardinal Seán celebrated the opening Mass. Mary said the cardinal was funny and profound and offered challenges and support for Catholic education. She said eight high school choirs performed during the opening Mass. She said about 35 bishops and priests concelebrated and about 10,000 people received Communion. They had many positive comments on the Mass. Scot asked who comes to the NCEA. Mary said seminarians, librarians, religious education teachers, pastors, colleges & universities, in addition to teachers and principals. Sheila said she keeps hearing from people who say they love coming to the convention when it’s in Boston because of the spirit they experience here. Sheila said people come from Argentina, Curacao, Argentina, Australia, New Zealand, and England among other countries. Scot said the convention is being co-hosted by the dioceses of New England. Jorge said he’s hoping to be able foster the relationships among dioceses in collaboration. Sheila said they had people from all the dioceses of New England working together preparing for the convention, even stuffing ten thousand bags the day prior and they all said how much fun it was to work together. Mary said it’s wonderful to come and make the connections, meeting superintendents from all over the world that she could be in contact with in the future. She said they showed a narrated video about Catholic education in New England that was co-produced with the Catholic Media Secretariat and they got rave reviews for it. Scot asked what led to the decision to have more than one diocese to co-host this convention, which is the first time it’s happened. Mary said all the superintendents and bishops agreed and all the staffs participated. Scot said it’s a blessing to work for a big dioceses because of the resources available and the partnerships that are possible. To involve the other dioceses who would never be able to host a convention is wonderful to be able to share it with them. Sheila said in her experience NCEA conventions have always been able bringing people together. But what has changed is the technology that they use to connect everyone. One example s that they have images from all the dioceses on monitors around the convention center. Jorge said they also had digital displays of students artwork available of all the artwork. Sheila said what doesn’t change is the energy that comes from being with people who share the same passion. Sheila said we’re keeping up with what’s going on in education nationally and internationally through the speakers in keynotes and workshops. Scot asked how many local leaders are involved in speaking in the various workshops. Mary said many of our principals and those on the Catholic Schools team are speaking. Jorge said it’s a tough choice to choose which workshops to participate in, so schools should bring many participants in order to later compare notes. It’s an opportunity to allow all of these people to be able to grow with one another and pick up best practices. Scot asked Sheila was she learned that surprised her. She said what energized her was bringing everyone together to organize this and the community that developed around it. Mary said they’re working to spread the good word of Catholic schools’ success and she’s pleased and honored to be part of this ministry. 3rd segment: Scot welcomed Fr. Ron Rolheiser to the show. He was the inaugural keynote speaker. Scot asked him he likes to speak to the convention. Fr. Ron said it’s one of the larger gathering of Catholic educators in the world, but also there’s a special energy. They are people deeply involved in Catholic education. They are passionate about their jobs and hungry for information on Catholic education. Fr. Ron said it’s the same for all careers, that you have a special energy when you meet with people who do what you do. Scot said Fr. Ron is currently the president of a Catholic college in San Antonio, Texas, the Oblate School of Theology. He’s know as a Catholic author and speaker. Fr. Ron said he tries to limit his speaking to twice a month because he has a full-time job. Scot said Fr. Ron covers many topics of Catholic spirituality. He asked Fr. Ron how defines himself as a Catholic speaker. He said he defines himself in terms of his Catholic spirituality. He said his Catholic education gave him a solid foundation and now he belongs to a missionary order and he sees himself as one who speaks to those who are away from the Church. Fr. Ron tries to write for doubters, questioners, and those struggling, and likes to work with those doing that kind of work. Scot said Fr. Ron is a member of the Oblates of Mary Immaculate. He said he grew up knowing the OMI order and that’s why he joined them. They turned out to be a very good choice. The keynote’s title was “Keeping a mellow heart in a bitter time.” Fr. Ron said he picked the topic because it’s something all of society needs to reflect on. The world is in a time of polarization and misunderstandings at a global level that filters down. there’s anger and demonization and bitterness. His challenge was to talk about how to remain understanding and respectful in a time when virtually everything leads otherwise. Scot asked if it’s new that we let politics seep into how we think of our brothers and sisters in the Church. Fr. Ron said it’s always there, but not so intense. Throughout history we went through times of more or less bitterness and division. He cited how Vatican II occurred at a time when documents could be produced that saw no winners of losers. Sadly, today there wouldn’t be such consensus. The media is helping to inflame bitterness and division. Fr. Ron said we end up bracketing three of the most fundamental virtues there are: respect, charity, and graciousness. We do it under the title of cause or truth. He said Jesus was neither liberal or conservative. Instead he goes wherever truth and charity take him. Fr. Ron said the solution is in the Gospel. He pointed out Christ’s opening word: metanoia. We translate it to English as “repent”. The Greek word literally means to “put on a higher mind”. It rejects the fear and ideology of paranoia. Christ could be saying, “trust and believe there can be good news.” We either go to “metanoia” “the big mind” or “paranoia” “small mind”. Then he talked about Christ washing the feet of the apostles. On one level it’s Christ showing the apostles how to serve one another. On another level, it’s about crossing dividing lines. It’s not about saying truth is relative. It’s about how we talk and have a dialogue. entering a conversation with the intent to prove the other wrong is not a dialogue. Intending to understand is a dialogue. What happens is that the extreme positions take over the dialogue and the middle is marginalized. Even if we don’t agree, we owe each other respect and charity. There tends to be mean-spiritedness on both sides, but you don’t see it in Jesus. Scot asked how he address this to Catholic education. Fr. Ron said we have to form Catholic minds and Catholic hearts. The word catholic means universal. We need to form a huge heart, a big mind, a Catholic mind. He said the theme of all his work is to help people to face the mystery of God in their lives.